Inadequate (adjective): lacking the quality or quantity required; insufficient for a purpose. Take a moment to reflect on your life to date. How many times have you felt inadequate? If you’re like most people, your answer is probably “a lot“. But, where does this feeling of inadequacy derive from? Watch a baby as it’s learning how to walk. It falls down again and again, yet it is resilient and doesn’t give up. It has complete faith in its ability to use its body and doesn’t stop trying until it masters this ability. Unfortunately, for many of us, this self-belief changes as we grow. We adopt the fears and beliefs of others and start believing we aren’t good enough, aren’t smart enough and aren’t talented enough to do X, Y or Z. The longer we live in this kind of misalignment, the more we stunt our belief in ourselves…and in the absence of self-belief fear, self-doubt and unhappiness loom. Only those who lack self-belief can be inadequate. Don’t let that be you. Empower yourself, and believe in yourself enough to know you can accomplish anything you set your mind to (because you can!). We live in a judgemental society that prefers to break people apart based on their perceived shortcomings, rather than build them up around their strengths. This constant judgment of ourselves and others morphs into one of the most destructive habits we develop: negative self-talk. Habitual negative self-talk actually makes us believe we’re incapable, inadequate and unworthy. And what we believe becomes our reality. The first step to changing this is to become aware you’re doing it. Pay attention to how often you talk down to yourself, and what situations cause it. Then, every time you realize you’re being negative toward yourself, say 3 things you love about yourself. With continued practice, eventually, your negative self-talk will be replaced with positive self-talk and newfound personal belief. Self-image is something many of us struggle with. We become so identified with our physical bodies and appearance, we have a hard time understanding how infinite and powerful we truly are. If you’re ready to overcome feeling inadequate, start by re-creating your self-image. How do you define yourself? Who are you? Who do you want to be? Think about these three questions, and write down your answers. Give yourself the opportunity to re-create your self-image to what you want it to be — no what society or someone else wants it to be. This is your life, and as such you are the creator who gets to decide who you are, what you will become and how you want to be defined. Social media and celebrity-obsessed culture make it tempting for us to constantly compare ourselves to others. We see perfectly made-up, toned and “flawless” people and wish we were like them. But, there can be no comparison between us and others because we aren’t them — it really is that simple. You are who you are. I am who I am. We can’t be each other. We were all born to stand out and be unique. Rather than trying to compare yourself to others and wishing to be someone else, embrace yourself. You are a magical, limitless being — and you are the only you on this planet! Celebrate your uniqueness don’t sabotage it! All of us are creators who were incarnated onto this physical planet to create. We are infinite, limitless beings with a universe of potential inside of ourselves. Know this. Embrace it. Believe it because it’s true. You are enough. You have always been enough, and you can never not be enough. Whatever you want good, you can have. Yes, you will have to work for it. You will have to push yourself outside of your comfort zone. You will have to learn and grow. But, you can do it. You are fully capable of creating whatever life you want to live, and living it. So what are you waiting for? Go grab your life by the horns and live out your dreams. A failure is only a failure if nothing was learned. Otherwise, “failures” are actually stepping stones that assist us in getting from where we are to where we want to be. Then, use that lesson as a guiding point to make different decisions as you continue to move forward with your life. If you do this, rather than feel bad when things don’t turn out the way you wanted them to, your life will begin to change for the better and no experience you have will ever be in vain. 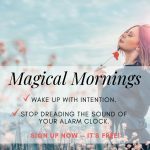 By using these 5 suggestions, you’ll be able to release your feelings of inadequacy and set yourself up for a lifetime of personal happiness and success. Need a little extra help releasing your feelings of inadequacy? 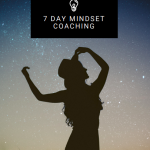 Click here to get a FREE 7-Day Mindset Coaching Journal! Aloha! Great article~well done on a much needed topic~THANK YOU, Antasha!! !